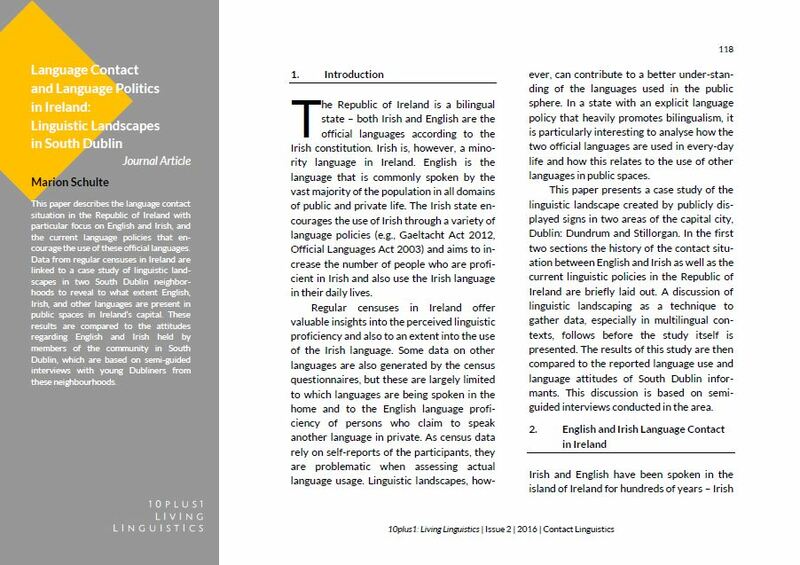 This paper describes the language contact situation in the Republic of Ireland with particular focus on English and Irish, and the current language policies that en-courage the use of these official languages. Data from regular censuses in Ireland are linked to a case study of linguistic land-scapes in two South Dublin neighbor-hoods to reveal to what extent English, Irish, and other languages are present in public spaces in Ireland’s capital. These results are compared to the attitudes regarding English and Irish held by members of the community in South Dublin, which are based on semi-guided interviews with young Dubliners from these neighbourhoods.